Forrester cites customer experience management (CEM) capabilities as the set of differentiators among a growing and fragmented Web content management product market. are proving to be the differentiator. And those capabilities are being developed as a result of user requests for things like multichannel delivery, content targeting, analytics and integration with other customer experience management technologies, according to a report released last month by Forrester Research Inc. of Cambridge, Mass. No single vendor or product currently satisfies all the components of an online customer experience management (CEM) ecosystem, says the report The Forrester Wave: Web Content Management for Online Customer Experience. That ecosystem includes WCM, marketing automation, commerce platforms, customer relationship management, analytics and on-site research. Even if a single vendor covered the gamut, most companies have made significant enough investments in individual products that integration between them will be an important factor in coming years. “Right now a lot of this stuff is siloed and it’s not built for cross-channel, and that will have to change,” said the report’s main author, Stephen Powers. Forrester divides the software market for online CEM into three tiers: process-based tools for creating and managing content for customer experience, delivery technologies for bringing interactive experiences to customers and measurement products so business can gauge the success of those experiences. “[The market has] got the process piece down, but we’re now moving into delivery and even a little into measurement,” Powers said. The ability of WCM systems and products to move into those other tiers by offering some of the components that make up an online CEM ecosystem while integrating with others will be a key to their success. Forrester picked those 10 vendors for the assessment because each offers a product that supports an interactive, multichannel experience, has a significant track record as the primary WCM system among large organizations, have been asked for by name or are being used by Forrester clients and generate a minimum of about $25 million in annual revenue. 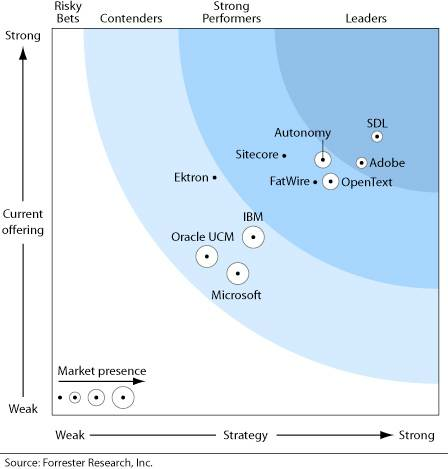 While The Wave singled out SDL and Adobe as top players, it said all 10 market leaders needed development to fully support customer experience management capabilities as Forrester sees them. The report goes into detail on how each of the vendors scored in individual tasks such as authoring tools, library services, content targeting, social and community controls, publishing and deployment and more. An intricate weighting system, detailed in the report, was used to create the wave graphic shown.